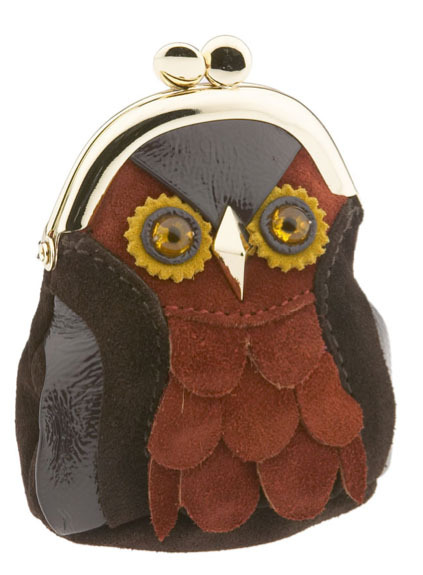 We got such an awesome response when I wrote about the Kate Spade Sherwood Owl Bag back in September that when I saw the petite, adorable Kate Spade Sherwood Coin Purse, I couldn’t not say something. And when I look back at the previous owl bag, I like it way more than I did when I originally wrote about it. Its personality and inventiveness have grown on me exponentially, and as such, I intend to drool praise on this smaller iteration quite a bit. Be prepared. Maybe wear a poncho. My one and only complaint is that it doesn’t have the feet. The tiny gold feet! They were so adorable! But when things are miniaturized, some detail has to be lost, and I guess that was it. But the little bag still features three types of suede, patent leather, a metal beak and glass eyes, which is basically a thousand times more creativity than you’re going to find in an average bag. I wonder if I could shove my Blackberry into it – if so, I’d definitely consider it as a cell phone case. Buy through Nordstrom for $125.